It’s been officially a year that I have been a fan of a singer. It started when I was watching the Radio Disney Music Awards. All of a sudden a girl dressed in white jumped onto the stage, and sang an awesome song. I asked my cousin who that was and she said “Becky G”. I immediately Googled her, went on YouTube and watched some interviews and music videos. When I got an Instagram, I followed her and got a sense of her personality. Ever since April 2014, I became a “Beaster,” or a Becky G fan. I found her story so inspiring and I was obsessed with her music. 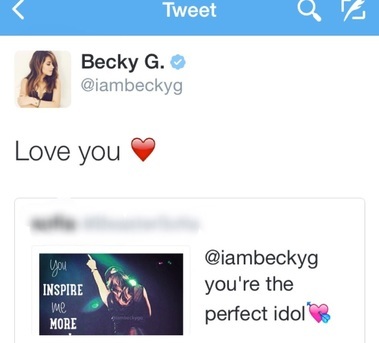 When I started following Becky G fanpages on Instagram, I noticed Becky reached out to her fans on social media. Becky follows her fans, comments and likes their pictures and videos. I told my mom at the grocery store in July 2014 about Becky reaching out to her fans online. I was nervous to ask, but I wanted to make a fanpage too. Seconds after my mom said yes, I created my own page. The first day I got mine, I gained almost 200 followers. Two days after I made it, I realized how hard it is for Becky to notice me. A month later, Becky posted something about meeting her on tour. I showed my mom and we immediately went on the link that Becky posted. The website said “Meet and Greet” and the tour dates. Right after that, I got my mom to buy tickets and I just needed to meet my idol, but I had to wait 120 days. If it wasn’t for Becky posting that, I wouldn’t of met her. In the 120 days, I became more and more of a fan. I understood her family tree and I was getting the hang of being in the fandom. Although being a fan online is a time sucker, I learned a lot about marketing and advertising. On October 21, 2014, I got to leave school early to go to the concert. I felt overwhelmed, overly excited, My mom, sister and I drove almost 2 hours to the concert place. I walked into this room with Becky’s cousin and other fans. I saw a group of guards and a small girl in the middle, it was Becky. It was amazing. Thanks to Becky for posting about the meet and greet, without that post, I wouldn’t of met her. On Instagram, there is a fanpage that Becky follows and she re- posts pictures from her account. The owner of that account, Chloe, was an online buddy that I talked to a lot. She wanted to make a “Merry Christmas Becky G” collage of fans holding up signs that say Merry Christmas in Spanish or in English. I threw on my Becky G shirt, earrings and made a sign. “Let’s go to Grandma’s now, she is waiting!” Mom kept yelling. I really needed a picture. I gave my iPad to my sister and she took a really quick picture of me in front of the Christmas tree. When I walked through the front door of my grandma’s house, I had my head down looking at my phone, before the family dinner start- ed, I needed to post the picture so Chloe could have it in the col- lage. After three hours of rough play with my cousins and eating a lot of food, I saw my phone glowing up and flashing. “What’s going on?” My sister asked and mapped me my phone. People commented, “She liked!” or “Becky liked! Congrats!” and “Hi Becky!” as if she is still on that post. “So, what happened?” My sister asked again. I logged into Instagram and it said, “36 comments, 201 likes and 12 followers gained.” I saw “iambeckyg liked your photo 28 minutes ago.” My heart stopped. My eyes were wide open and I screamed the loudest I have ever screamed. My dad woke up from his nap, my dog barked at me several times and my mom came up stairs and thought I was injured. “BECKY LIKED MY PHOTO!” My arms were shaking and I was about to cry. THE Becky G liked my photo on December 14, 2014 at 11:36 am. That day I realized the impact social media makes on fans. One morning, after I hit 2,500 followers on my Instagram, I wanted to check out Becky’s Twitter. I had no idea what favoriting was or retweeting or anything! But then I realized there was a #AskBeckyG and Tweet sprees. Beasters would tweet something to Becky and she would reply or follow. All I thought was: “This is so easy! I can get her to notice me everyday!” I thought “Now what?” I followed Becky and tweeted her. Ten minutes later nothing happened. I followed a bunch of other fans. She has 1.2 million followers, and I wondered how the heck I was supposed to get noticed. I tagged her in 237 tweets and still no reply, no favorites and no follow from Becky. On April 11th, I no longer cared for Twitter. I didn’t go on it as much, only to talk to online friends or to tweet about life, but I only did that once in a while. It was a Monday and I woke up too late for math extra help. After I got ready, my phone started flashing. I clicked the home button to turn it on and I saw it said, “iambeckyg followed you back.” I stared and froze. “MOM BECKY FOLLOWED ME ON TWITTER!” I screamed and I woke up the whole house. “Are you sure it was her? It could be fake.” she added. “Nope. It’s the real deal.” I was shaking. I was shaking in the car, in advisory, and I couldn’t stop smiling. I told everyone. The next day, my after-school sport ended early, so I walked home. I tweeted, “@iambeckyg you’re the perfect idol” and tagged her onto a picture that had “You Inspire Me and More Everyday.” I looked up and crossed the street, but when I looked down, my twitter had 20+ notifications! I stopped and asked myself, “What just happened?” I checked Becky’s Twitter and it had my name, my tweet and my picture. On top of it, she commented “Love You” with a heart. I felt like I was dreaming! Having social media accounts helped me connect with my idol and for my idol to connect to her fans. Now in the 21st century, young teens can connect with stars they get inspiration from. A single tweet or a single “like” can go a long way. Next articleCan Cyborgs Be a Reality?